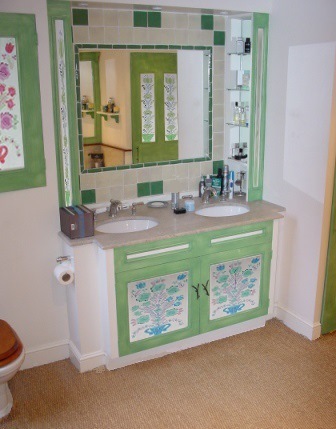 This is a beautiful modern interpretation of a folk art style bathroom. Virtually everyone today wants clean lines & surfaces for their bathrooms, with lots of light. You can have this & still combine it with traditional style. The room was kept bright with light wall colours & lots of mirrors to bounce light around & make the room feel visually lighter. The shower cubicle door has a full length dressing mirror, above the vanity is a large mirror & 3 mirrors are used at the back of the bath. Natural tones were used to soften the overall look, limestone for the vanity worktop, coir flooring, wood for shutters, wc seat, etc. Soft grey green was used as the highlight colour for the furniture, as it is complimentary to a bathroom/water. The double vanity is the focal point for the room. This is an elegant large piece of furniture, offering plenty of storage below, & even above with glass shelves either side concealed behind the vertical frames. The breakfront adds a bit more interest. The undermounted sinks under a limestone worktop is very elegant. The top frame includes 3 downlighters above the mirror, as well as concealing the shower extractor ducting to the outside wall. To the left of the vanity is the wc, with a concealed cistern hidden behind the wall, and storage shelves behind the doors above. 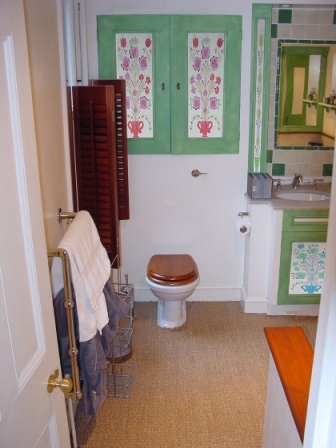 The decoration of the various painted panels was kept paler & lighter, as more suited to a bathroom. 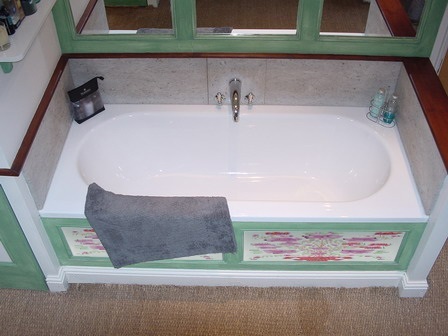 The bath had nice painted bath panel, with a limestone splashback above it, & a large 3 panel framed mirror. 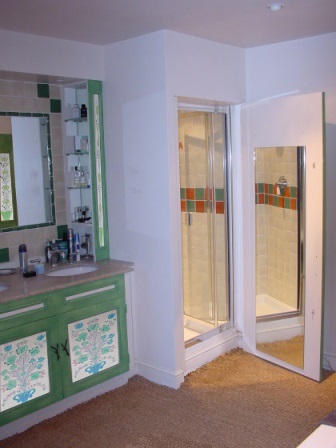 Next to in the corner was an airing cupboard, the same size as the shower cubicle, for visual balance, with painted door panels. This bathroom shows you how to incorporate traditional elements & style with the requirements of a modern bathroom. We design & produce bathrooms like this to order.